If you’re not a meat eater, you probably don’t want to scroll any further. 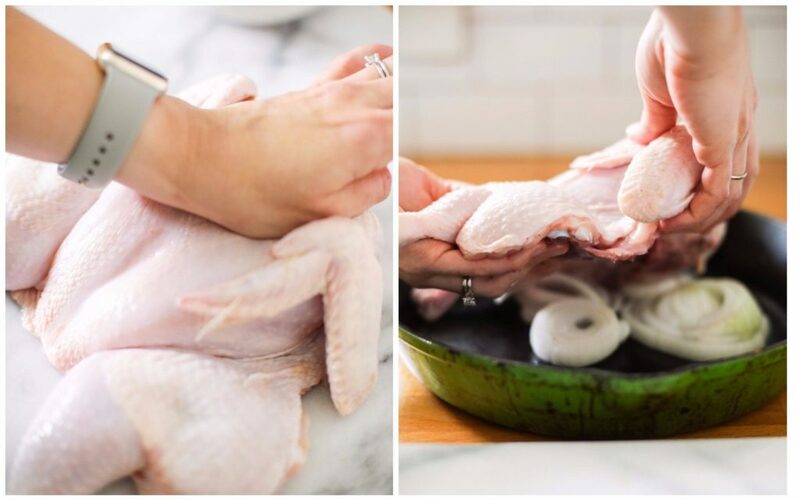 I’m not kicking you out, just letting you know that today’s post is filled with step-by-step photos that feature raw chicken and bones. If you’ve been around Live Simply for any length of time, you’ve probably heard me talk about meal prep. To me, prepping is the only way to make real food work with a full schedule. I prefer to spend an hour or two on the weekend prepping food for the week ahead (making one or two breakfast or lunch options, and chopping veggies for lunches). To me, this is time well spent. Prepping a few items for the week ahead helps save me precious minutes in the morning when I’m trying to feed a family and pack lunches. Those precious minutes, as all parents know, are incredibly valuable on a busy morning. Every second counts. Life happens (birthday parties, family in town, a weekend getaway with the family, etc.). There are times when a dedicated hour or two of prep just isn’t a main priority on the weekend. To get me through such times, I add two meals to my weekly meal plan: a whole chicken (or two, depending on your family size) and soup. Both meals keep on giving. Both meals function as dinner, as well as prep (lunches throughout the week). Win-win! The whole chicken(s) may be roasted or slow cooked. Some of the meat may be served for dinner (maybe roast a tray of veggies or make a simple salad and dressing, and cut up some extra veggies on the side for remaining days), and some may be stored in the fridge to make sandwiches, quesadillas, tacos or tossed on salads throughout the week. The bones may be used to make broth, which then may be used to make soup. And the soup? Well, soup is the original one-pot wonder budget meal. And it easily stretches over two meals, or more. 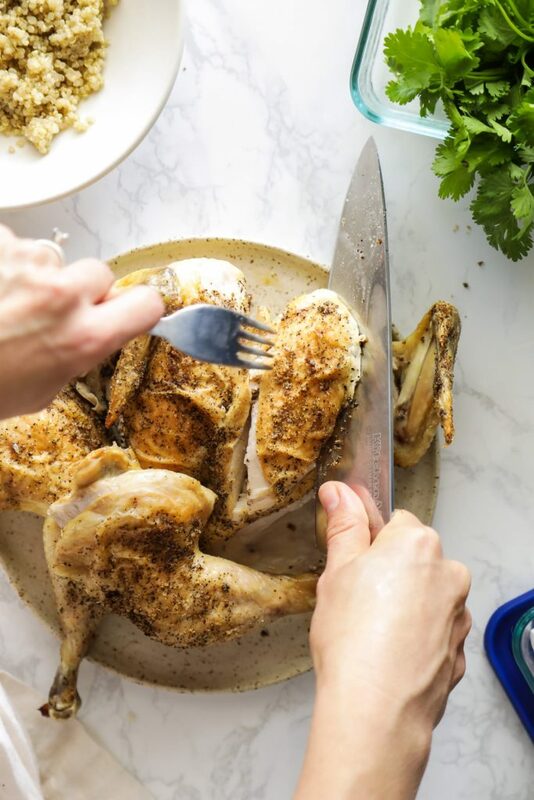 Learning how to prepare a whole chicken is one of the most valuable real food cooking lessons one can learn, along with how to make a basic soup, how to roast veggies, and how to make a simple salad dressing. With these skills, you can feed a family on any budget, with a variety ingredients, no matter how much time you have available to spend in the kitchen. 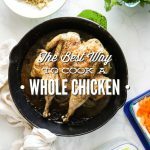 Since cooking a whole chicken is such a valuable skill, and it is a great way to prep for the week ahead, I want to share my absolute favorite way to prep a whole chicken: the spatchcock method. Also known in my home as, The Best and Quickest Way to Cook a Whole Chicken. The name, spatchcock, is interesting and sorta unusual. Who chose that name? And why? I can’t answer those questions, but I can share what spatchcocking is. Cool? Spatchcocking is a term that refers to removing the backbone of a bird (whole chicken, turkey, etc.). Once the backbone is removed, the bird can lie flat on a sheet pan or skillet. Cooking a chicken (or turkey) this way does two things: 1. Results in the crispiest, juiciest cooked chicken. 2. Reduces cooking time. 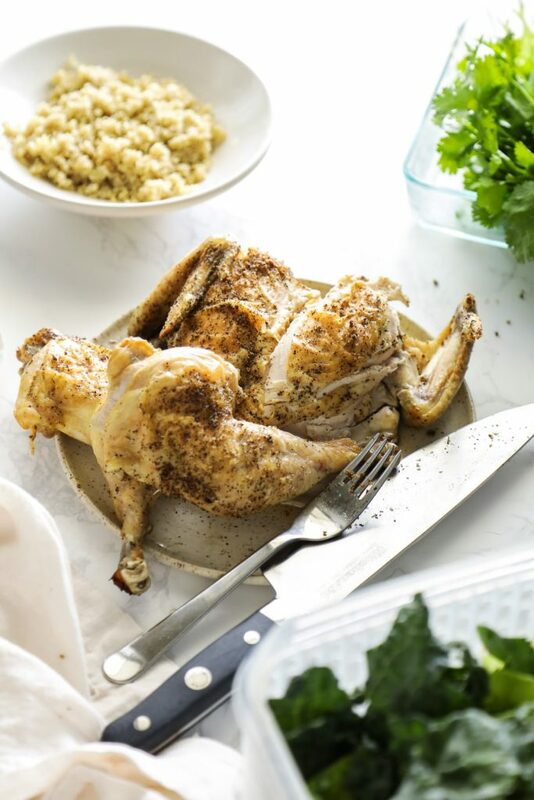 A spatchcock chicken doesn’t need to be covered while cooking, and it only takes about 50-55 minutes to cook (for a 3-4 lb bird). 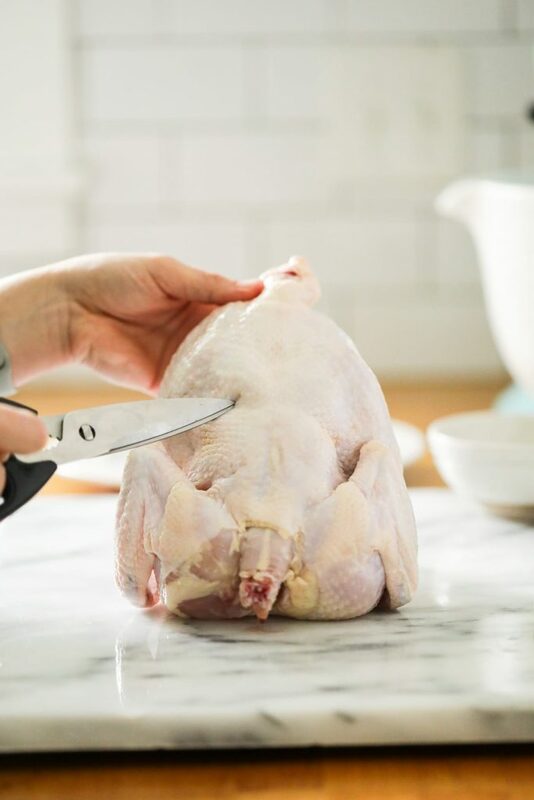 Once cooked, let the chicken cool for about 10 minutes before serving the chicken, or storing the cut chicken in a storage container for the week ahead. I typically store the leftover meat in the fridge (remember, this is the perfect way to prep without spending a dedicated prep time in the kitchen), and use it to make sandwiches or salads throughout the week for lunch. 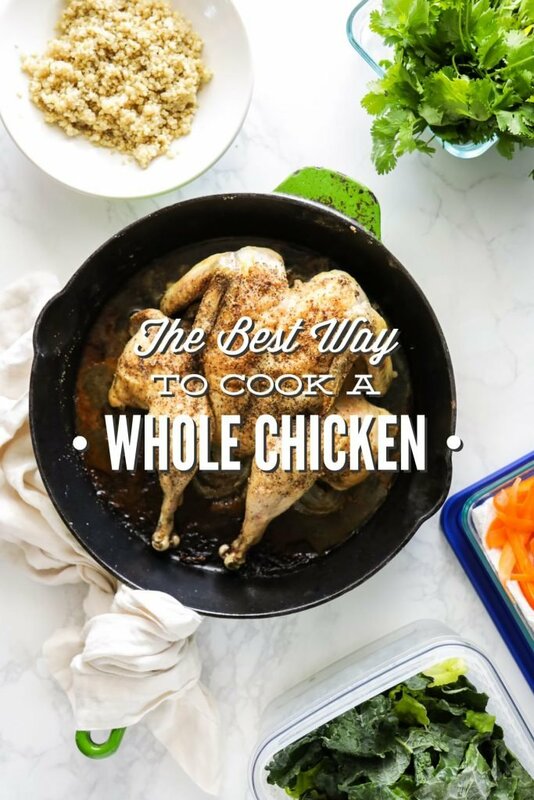 The best and quickest way to cook a whole chicken. 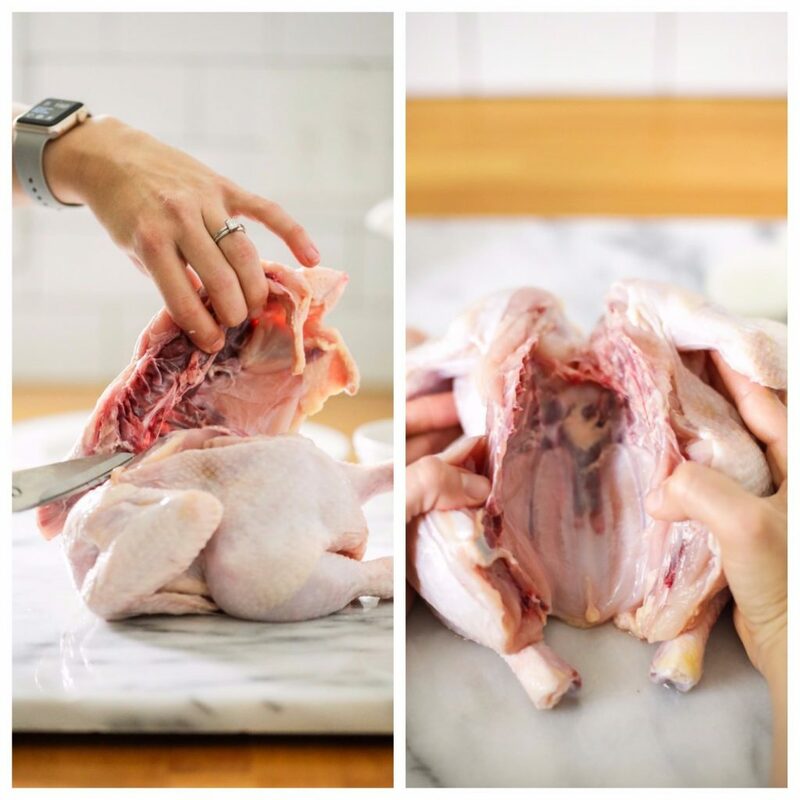 Using kitchen scissors, cut down each side of the chicken's backbone. <--This is on the underside of the chicken, not the breast side. Remove the backbone from the chicken, and keep it to make broth/stock later, or discard it. Place the chicken, breast side up, on a cutting board and press down on the chicken until it lies as flat as possible. Place the onion slices in the center of the sheet pan, or a large oven-safe skillet (such as a cast iron skillet). Place the chicken, breast side up, over the onions. 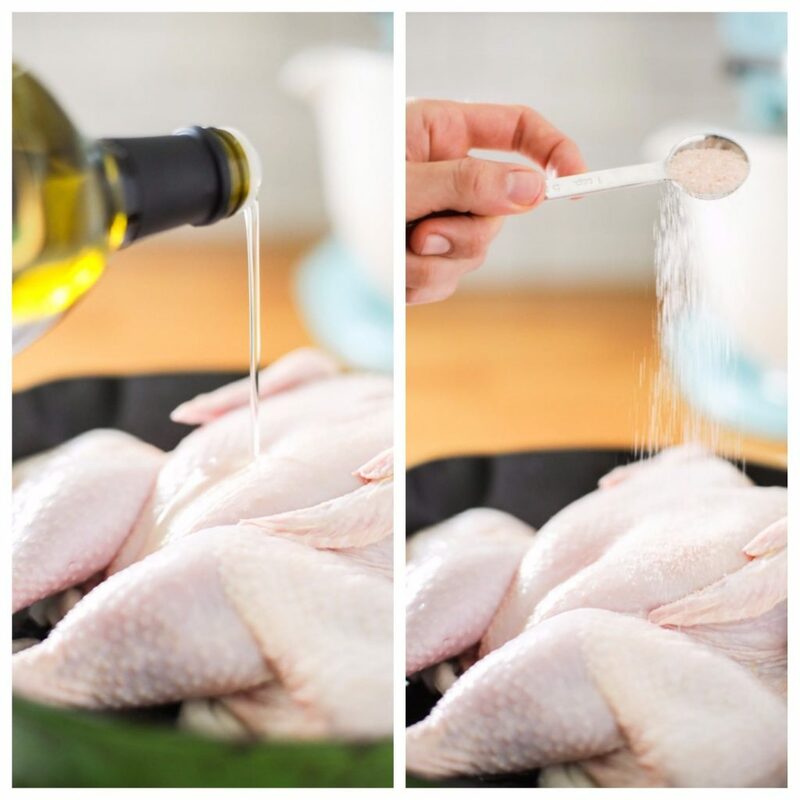 Drizzle the oil over the chicken, rubbing the oil over the chicken skin. Generously sprinkle the chicken skin with salt and pepper. Cook the chicken, uncovered, for 50-55 minutes, or until the skin is brown and the juices from the chicken run clear (when the area between the leg and thigh are cut). Allow the chicken to rest for about 10 minutes before cutting and serving, or storing in a container for meals later in the week. If you're prepping this chicken in advance, or have leftover meat, here are some ideas: chicken salad (curry or deli-style), chicken noodle soup (could also make this on the stove-top), nachos, chicken pot-pie, an addition to salads, a lunchmeat alternative. Want to try something different? 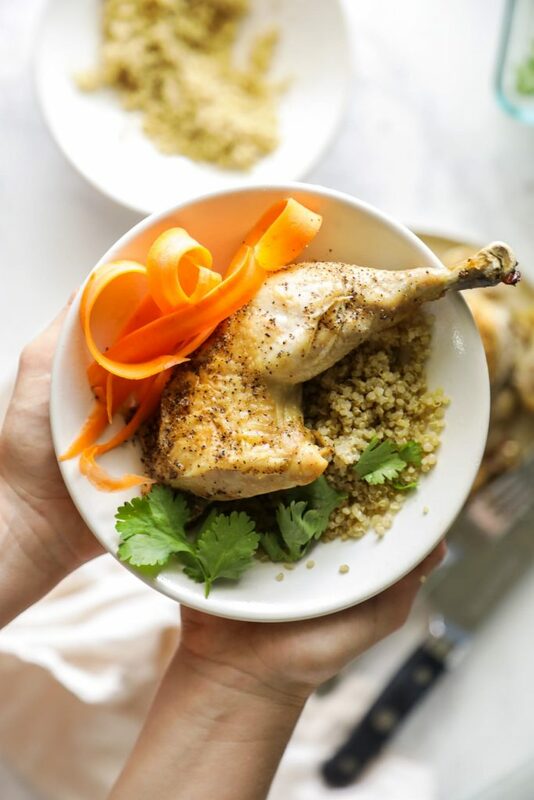 Try this barbecue spatchcock chicken from Raising Generation Nourished. The secret is in that pan!!! Love it !!! I made this last night for our little family of four and everyone LOVED it! My husband is extremely picky and our children are 3 and under. For my husband to ask for seconds, you know it’s a keeper! I will definitely be making this again and again! Saved the bones and leftover meat and will be making chicken, veggie soup. Two meal meals for the price of one! If you haven’t tried this, do it!! Yay, Kristin! That’s so great to hear! We just roasted our first whole chicken! Thank you for the encouragement and recipe! It tasted delicious! Yay! That’s so great, Megan! I just discovered this way of cooking a chicken and its amazing! Do you think in addition to the onions under the chicken, you could put other vegetables (zucchini, bell peppers, etc) to cook at the same time? Hey Sophie, Definitely! I would cook the chicken for the first 30 minutes, then pull it out and add the veggies around the chicken. Then cook for the remaining time. I’m so glad you’re loving the spatchcock way…it’s the best!